Bernward, LLC I Comer Construction, Inc.
Kimball Construction Company I Mid Atlantic Industrial Construction. Power & Combustion, Inc. I James A. Quick, Inc.
Rosendin I Shade Construction Company, Inc. Signals Defense, LLC I Stella May Contracting, Inc.
that can provide fast turnaround on warrantied tools and peace of mind that your products are in the hands of experts. Rosendin, headquartered in San Jose, Calif., is an employee-owned electrical contractor. With revenues upwards of $2 billion, Rosendin is one of the largest electrical contractors in the United States with over 6,000 employees and 16 offices. building values for clients, and building people within the company. Hart Consulting & Construction Services serves all construction contract Stakeholders. Our focus is to provide solutions and guidance at all phases of the construction project. Construction projects succeed by recognizing risks/problems early and creating opportunities. By maintaining regular communication and understanding the risks and stakeholder expectations, we can plan and execute to achieve the desired outcome. Our experience covers a broad range of market disciplines, project owners, contract types, and technical challenges. the Special Olympics of Maryland’s Annual Polar Bear Plunge! individuals and supports their passion for athletics. Welcome to Maryland AGC, the Maryland Chapter of the Associated General Contractors of America. Maryland AGC prides itself in bringing quality services to our members. We also value the communities in which our members live and work, and we seek to make whatever contribution we can to helping those who need our help. Above all we are proud to be a member of the construction industry.Are you a leader whose company is best in class, always striving to stay abreast of the latest developments and best practices? Or is this what you aspire to become? AGC is the best resource to help you achieve those goals. It involved a "crazy-tight timeline," a landlocked urban site, mid-project design changes and a tower crane set inside a bathroom, but the construction of 1525 N. Calvert Street tested and proved Plano-Coudon Construction's abilities to complete big projects in the face of big challenges. 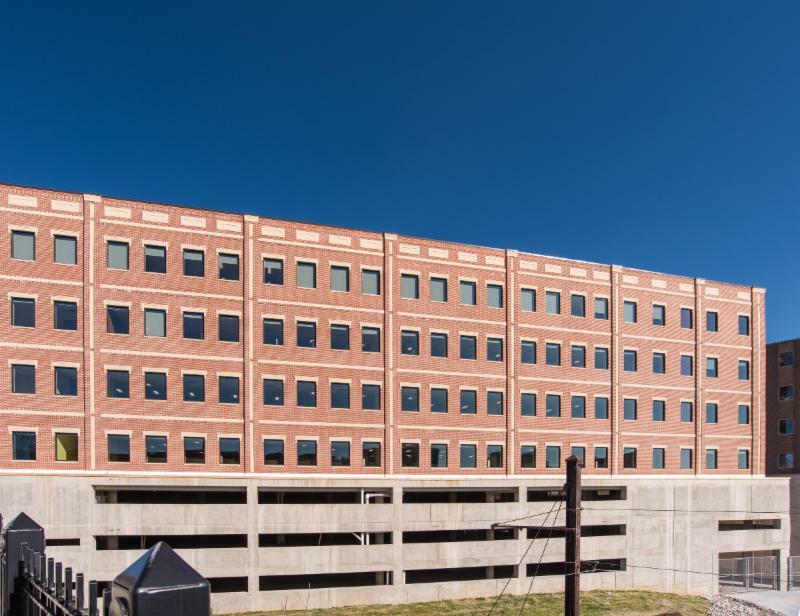 When Calvert Federal, LLC unveiled plans to construct the seven-story, 105,000-square-foot office building that included three stories of parking garage, the Baltimore Sun reported the project included a "crazy-tight timeline" and an "unusual approach to planning." To meet the move-in date specified on a lease agreement with state agencies, crews would have to complete construction within 13 months. They would also have to start laying the foundation, which included 182 augercast piles, before permits were issued for the building design. "Right out of the gate, we were working six days a week, 10 hours a day," said Travis Bartlett, Project Manager at Plano-Coudon. Monthly scheduling meetings, close coordination with subcontractors, periodic overtime and expanded crews, and arrangements to complete some tasks out of sequence became essential to keeping pace with the construction timeline. Plano-Coudon also had to devise a method to access the extraordinarily tight site. Bounded by railroad tracks, the Calvert Street bridge and an existing office building, the triangular lot offered no ready opportunity to bring in heavy equipment, materials and workers. "The best thing we did was decide to use a tower crane to build the project," said Ryan Coudon, Co-founder. Crews placed the crane within the footprint of the building in a 10-foot by 10-foot space that was set to become a washroom on each floor. "We maximized the use of the crane for as many trades as possible - the steel erector, the concrete subcontractor and others - until the last minute when we had to remove the crane, and seal up that hole in every floor and the roof in order to enclose the building," Coudon said. The project presented other challenges, including tying the building into an existing, adjacent building and into the sloping Calvert Street bridge. Mid-construction, crews also had to adjust to design changes which shifted the north west sides of the building and added a permanent retaining wall. They also had to coordinate work in an adjacent, occupied building. 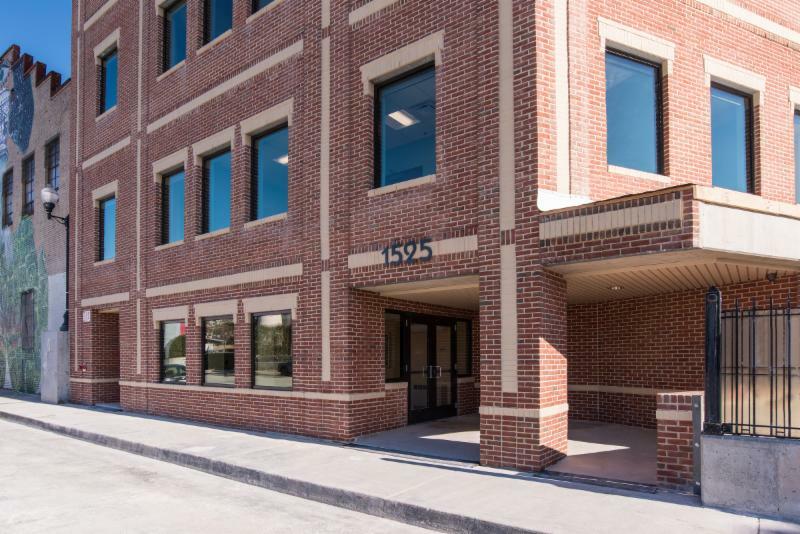 "All of the electric, sewer and water services for 1525 N Calvert had to come through a separate building," said Michael Kovacs, Project Executive at Plano-Coudon. "Then late in the design, the fire marshall said we needed an egress off the northeast corner of our building. Because we were landlocked, there was no place for pedestrians to go other than through that existing building." Consequently, crews had to coordinate off-hours work in the adjacent building to install utility lines and fire-rated enclosures for them, create a fire-rated egress for 1525 N. Calvert occupants, and rework partitions and cubicle arrangements to accommodate those additions. "It took creativity to complete this project," said Rick Gabell, owner's representative. "There were substantial challenges, a very compressed time schedule and a landlocked site that meant they had to construct the building from the bottom of a 30-foot hole. Plano-Coudon did a great job at reacting to changes, reworking schedules and expediting changes." "We have done tight, urban projects before," Coudon said. "But we are even more confident now that if you have a tight, urban setting where things are stacked against you logistically, we know how to develop solutions and detailed plans to make that project a success. ".